The downside to posting late is forgetting all the tiny details of what you did and how much you paid and where you went. But what the heck. 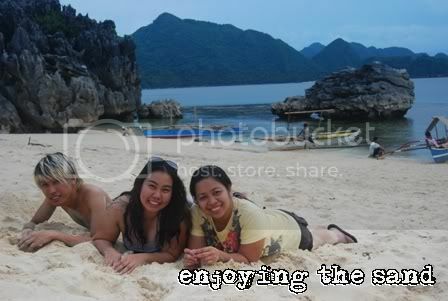 Let me post the continuation of my Caramoan travel adventure. 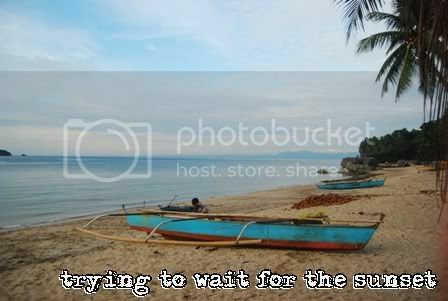 This is the continuation of my post entitled The Cebu to Caramoan Trip. To give you a brief overview, last June 12th, Edcel, Meryl, Rich and I flew all the way from Cebu to Manila (after our shift from work) and waited for another 7 hours before tavelling (8 hrs) by bus to Naga City in Albay where we again travelled for 2 hours to reach the port of Sabang. 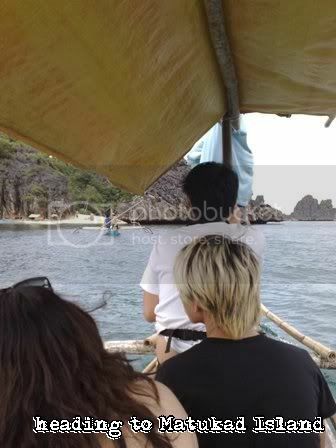 Then we travelled by boat for another 2 hours to reach Guijalo Port in Caramoan. After leaving our stuff in Villa Juliana, we headed to Lutong Bahay and ate our lunch. After we ate our lunch, some of us went back to Villa Juliana (the place we stayed) since we forgot some things. 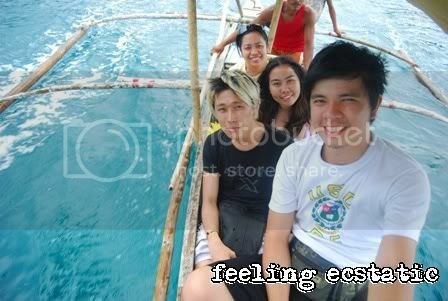 Then we headed to Paniman Bay as our boat awaits us there. 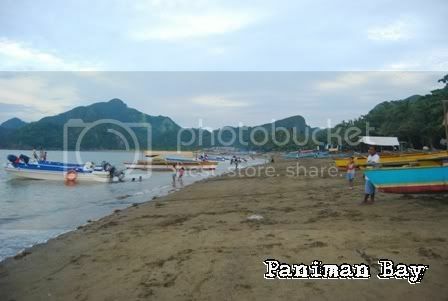 This was the official start of our Caramoan tours. I forgot how long it takes to reach the bay area but it was a long ang bumpy ride. I think it was a 20-minute ride or so so. 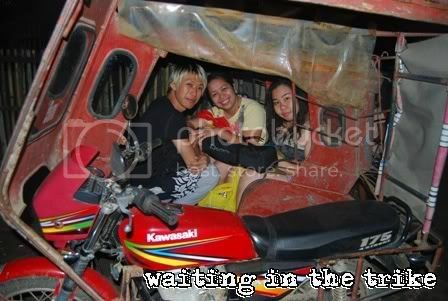 We already contracted the trike who fetched us at the port to be our official trike going back and forth the bay on this tour. 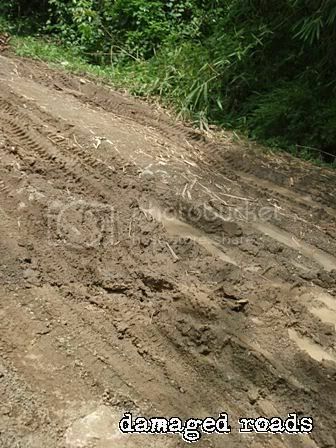 I asked our tour guide if the roads here has always been like this. 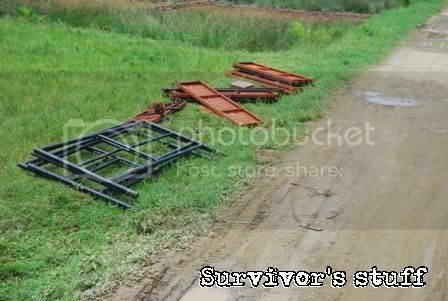 He said that the roads were damaged because of the big dump trucks that Survivor crews hired to transport their materials for the show. When we reached the area, we were surprised to see our boats. 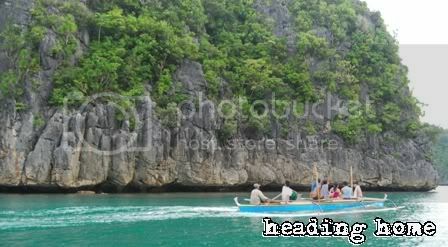 I really thought that the boat was huge, or at least decent but what we saw were small motor boats that fishermen use. One couldn’t help question the durability and safety in using the boat since we will be treading the sea waters of the peninsula. There was not even one sight of a life vest in the boat. Oh well, so much for fearing the boat. When it’s your time, it’s your time 😆 So left with no choice, we rode the boat. hehehe. Since it was already past 12noon, our tour guide told us that we’ll just go to Matukad Island and then to Lahus Island since we might ran out of time. Oblivious to where those islands where or how far they were from the mainland, we just conformed and allowed our tour guide to lead us the way. By the way, we actually didn’t know we hired a tour guide. Before we left for Caramoan, we tried to do some research online so that we’d be prepared and we’d know what to expect and do in Caramoan to avoid wasting time. 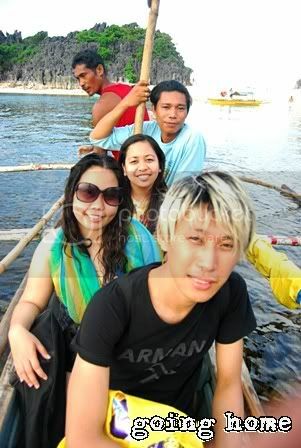 This one blog talked about Kuya Jay and how he was so helpful and all when they were touring Caramoan. 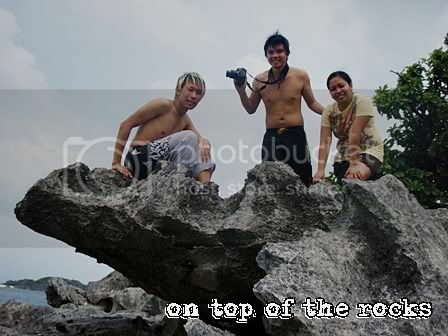 The blog never mentioned that he was a tour guide. All I thought was that he was a regular tricycle driver who goes the extra mile to extending his services for his passengers. I was surprised when I learned that he was a tour guide. Surprised because he charges P500 a day for the tour. I really don’t have any complains since he really took care of us the whole time we were there. What I just don’t like was charging us extra for the boat ride. I even tried to haggle but they wouldn’t give in. And on our last day, before we left Villa Juliana, its owner showed us the tariff rates for both the tricycle and boat fare. And then we learned that we paid P50 extra for the one way trip to Paniman Bay and then the boat fare are cheaper by P200 to P500 pesos or that we could have gone to more islands. At one point of the haggling, Kuya Jay mentioned that it’s not on a per island basis but the gas that will be consumed for the whole trip. 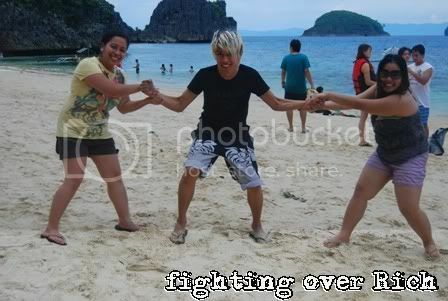 On this half day tour, if my memory serves me right, I think we paid P800 for the trip and we went to three islands only. 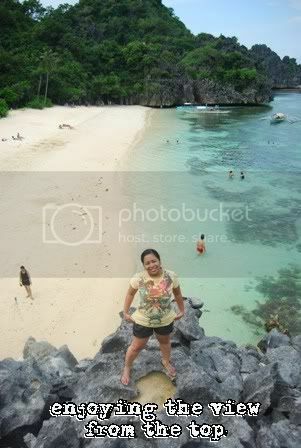 Will discuss more of my disappointment on my Day 2 trip in Caramoan. 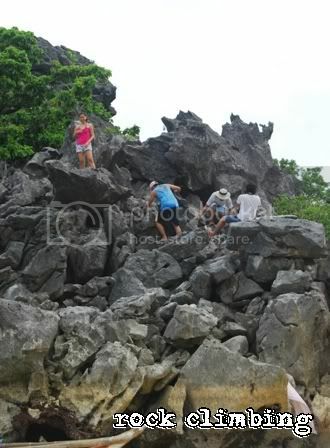 This huge rock was the first rock formation we passed by as we tried to go to Matukad Island. 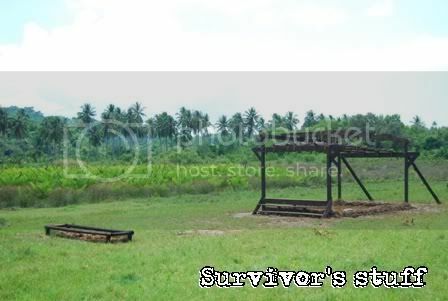 Then we also passed by Gota Beach Resort, the official home of Survivor Bulgaria, which was shooting for their show at that time. This lagoon is said to be enchanted. 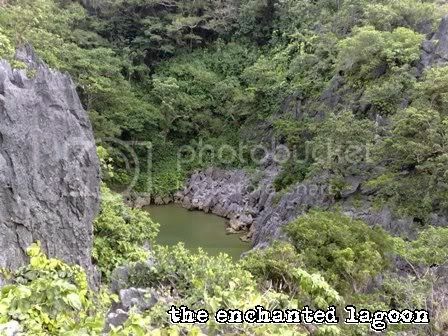 Folk stories tell us that this lagoon was home to two enchanted milkfish before. 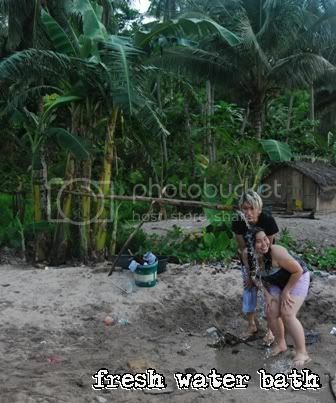 One day, someone took the other milkfish and soon after, a member of his family died. And indeed I saw one fish swimming in the lagoon. Although we were at the top of the mountain, we could see the fish moving in the lagoon. 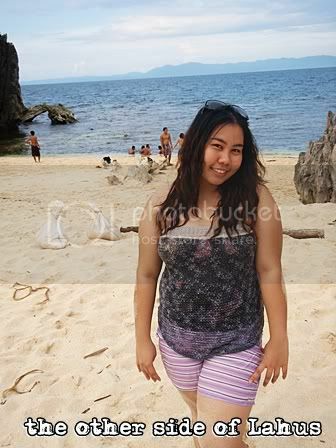 After Matukad Island, we went to the nearby island of Lahus. Lahus Island is really a small island, much smaller than Matukad. 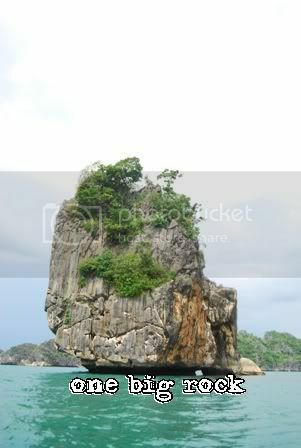 It’s just two big rocks on both ends and a stretch of white sands in between. The sun didn’t show up on this day so the white sand didn’t really stand out. How I wish the sun showed itself so that we could have enjoyed this island better. 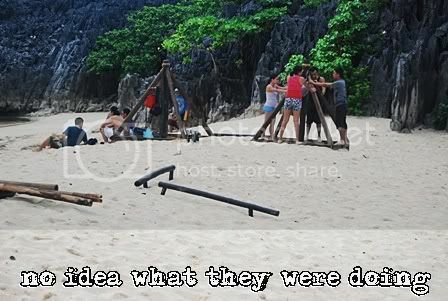 The crew of Survivor may have left their props on purpose since we saw a lot of the items in the island: bamboo poles, sacks, and a lot. So since we had a lot of time to kill, the guys started goofing around. When it was time for us to leave, Kuya Jay asked us if we want to check out the island which has fresh water flowing abundantly. There was still a lot of time so we agreed. We went to a big island this time. I just forgot what it’s called. Then we saw the make shift bamboo via duct where water flows non stop. They said that it was fresh water from the mountains and its drinkable. 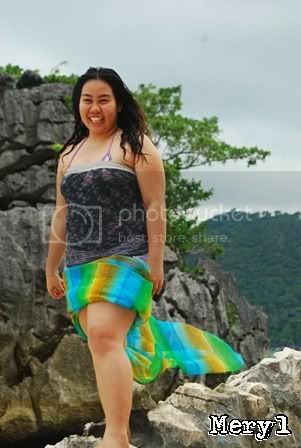 Those who swam in earlier were able to wash off the sea water using the free flowing water. Some also tried to drink it and they confirmed that it was indeed fresh. After they finished washing, we headed back home. 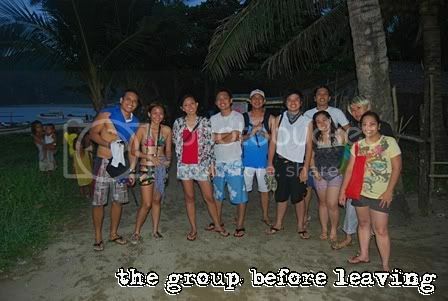 Before we went our separate ways, we took a picture of the group and Ed, being the sociable one, exchanged his email address, Multiply and Facebook IDs with the rest of them. We immediately went back to the inn and changed clothes for dinner. The other group even invited us to have a few drinks after dinner but I guess we were all too tired that we just went back to our rooms after we ate dinner and slept. We planned to go to church and hear mass the next day so we had to make sure we rest properly. I enjoyed looking at the photo’s since I know I’ll never get to see that area myself. It looks like everyone had a great time. .-= Jude´s last blog ..I Finally Upgraded My WordPress =-. I’m glad you liked looking at the photos 🙂 even though you couldn’t see it firsthand. 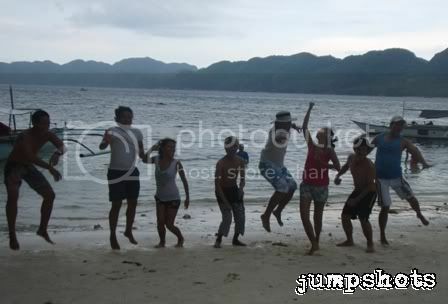 We really had a great time here but the fun part was when we went on a side trip to do skimboarding before we went home. Hopefully I can show more pictures soon. 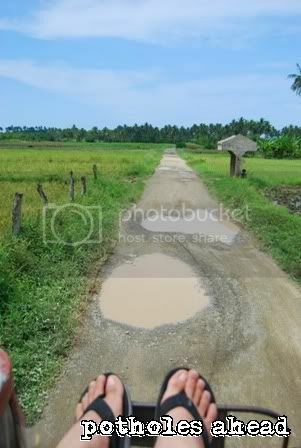 hi doi, nice photos, teka baket nandyan ako? L.O.L! .-= meryl´s last blog ..NATURE’S BEAUTY / WEEKEND SAILING =-. .-= Karen @ Remergence´s last blog ..More of our releases now on BandCamp! =-. .-= Cashmere´s last blog ..The Root Of All Evil [Part II] =-. the place really looks great. 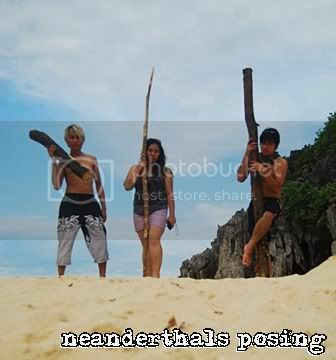 Are you the one who took these pictures? Because they all look professional! Very nice shots! hi marky! my companions and i took turns in taking the pictures. thanks for dropping by. .-= Lifey´s last blog ..My Top 10 Emerging Influential Blogs of 2009 =-. .-= meryl´s last blog ..DU QUOIN STATE FAIR, IL / WEEKEND FUN =-. 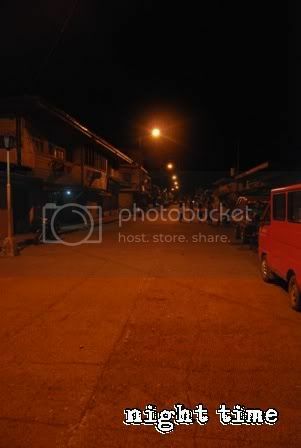 .-= iamtrix´s last blog ..Ipagpatuloy ang Laban =-. 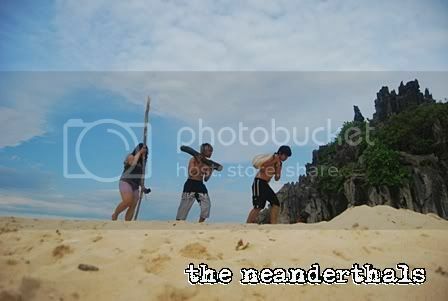 Thank you for sharing your adventure in Caramoan. I’m also in the process of gathering some informations for my dreamed trip. Sir I have two questions if you won’t mind. 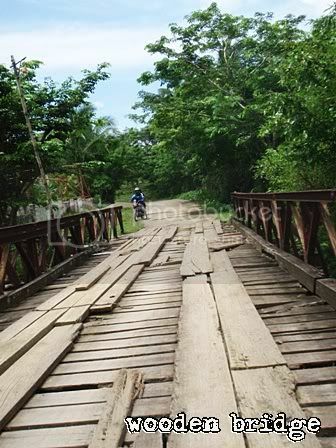 1) On the first picture, is that the last bridge before reaching Paniman? I’m planning to navigate that river with an enflatable kayak and that is my ‘would be’ starting point before island hopping. 2) About that “fresh water bath” photo, is that located just opposite of Lahus island? I’m not sure if that’s the last bridge since I already forgot if there were a lot of bridges going to the area. 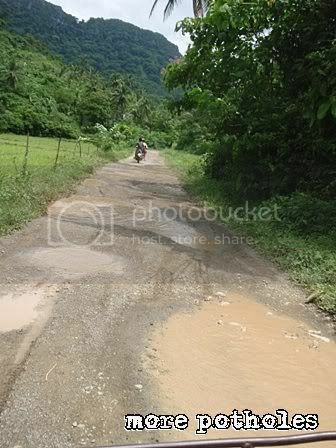 All I remember is that that is the bridge you’ll see when you make a right turn from the main road going to Paminan Bay. 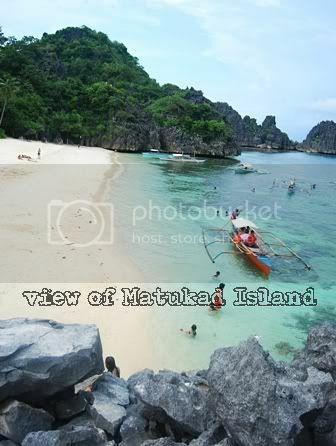 As for the fresh water bath photo, yep, it is the island across Matukad and Lahus. 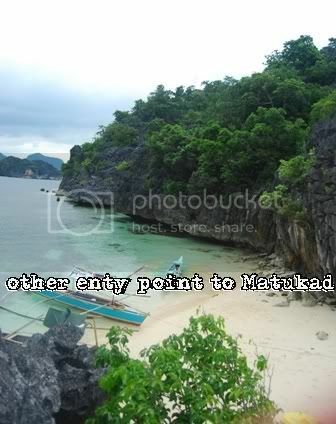 When going there, you’ll see Matukad and Lahus on your left and that island on your right. Hi. 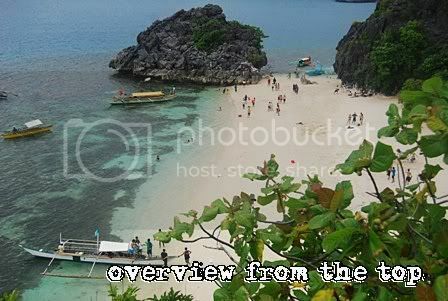 I’ve read your blog about Caramoan and this was posted in 2009. And it wasn’t as well known yet compared to now and the Survivor Caramoan might have just appraised the value of the cheap inns. 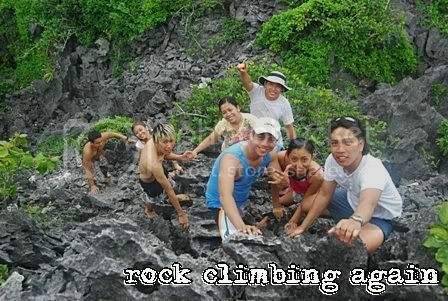 We’re in 2013 and my friends and I are going there this April. Can you at least give me an idea, ballpark, of how much would the inns cost now, please? One other thing, also, can you tell me how to go there, the bus we have to take and whatever side trips they got in that place? Thank you so much for the help.